I live in a home, built in the 1960’s, located near Rowan University. Our town, and the University, once known as Glassboro State College, has grown at an amazing rate during the last decade. Old houses have been torn down and large buildings, new roadways, and public parks have taken their place. The area is no longer known as downtown Glassboro but is called Rowan Boulevard. I’ve watched these modern structures being built for several years, and they are impressive. My neighborhood is far enough away from the building to be unchanged, at least for now. 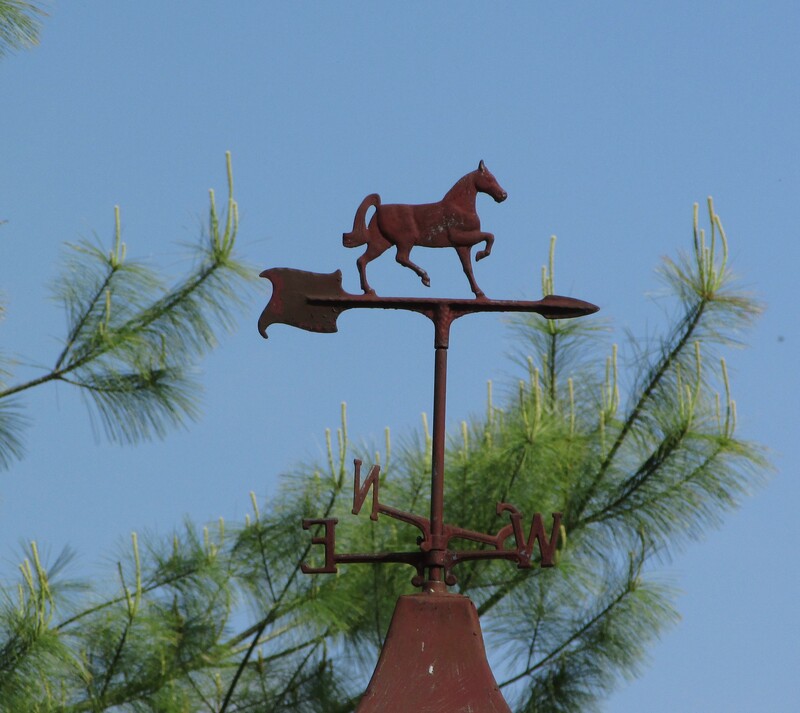 This weathervane I’ve featured is on the cupola of one of the homes near mine. I think it is probably original to the house because other houses in the neighborhood have the same weathervane. Sometimes you don’t have to go far to find what you are seeking, as in the case of today’s post. I miss the WordPress Photo Challenge and thought an interesting alternative would be to offer one of my own on Wednesdays. Weather Vane Wednesdays is just what the title implies, a photo of a weather vane. I have yet to find a weather vane in my city. I don’t think they were a usual addition to structures around here. I have found they are often in seaside areas. Many houses and buildings in my state and surrounding areas also have cupolas on the roofs. These are often the setting for the weather vanes. One of these days you’ll not be looking and voila`, there will be a weather vane. I hope you’re right. I’m about as far away from the sea as you can get! I love your search for weathervanes- if I do find one anywhere near where I am or where I travel, I will make sure to take a picture and send you one. Now I am inspired too. I am thinking of a book I read recently about ghosts, weathervanes, recipes and everything put together set in San Fransisco and I can’t think of the title- so sad. I am fasting today so my brain doesn’t work well but I searched on the net and got it- its called Give up the Ghost and it’s written by Juliet Blackwell. It is all about weathervanes. My brain does ramble and I am always in search of patterns, Kathy. Only 2 hours more. Yippee! I am reading a blog now that I think you may like, its called feedingonfolly.com. Its been keeping me laughing the whole day. I’m going to go and take a look. Love the title. I could use a good laugh. It is a dreary week here…so much rain…but oh my…my gardens are really happy. Oh Kathy, I was thinking you would think my constant referring of new blogs to you as obtrusive- but I feel it in my heart you will love this blog. I just read the post about their move…it was great…I left a comment. Thanks for the link. Funny…I started to check the box to follow and saw I already had checked it. I need to go through the blogs I follow and uncheck a few so I don’t have so many that I miss the really good ones. Again, I looked in vain. One day…when you least expect it…there it will be waiting for you. It might be a long wait. Or it could be today! I like to read yor comments. Thanks…and I like the comments that you leave. I love the weather vane. We don’t have many around here as the wind usually means something bad! Thanks Kerry, thanks for stopping by today. Thanks, we have a couple in the neighborhood since the houses have the cupolas on the garages. I loved the street sign weather vane, and also the sailfish. Thanks so much for taking part. I’m going to do what I’ve seen some other challenges do and list those who have taken part in the challenge with a link to their blog post in the next week’s weather vane post. sounds good – and sorry I did not leave my link in the comment box. Also, IU need to come back and share that I have a special little sheep table-top vane for you – and you were sorta with me earlier this month when I found it! I love it that you think of me. I also think of bloggers and it seems like a good friend has dropped by to say hello when you leave a comment on my post. You have a really good day too.